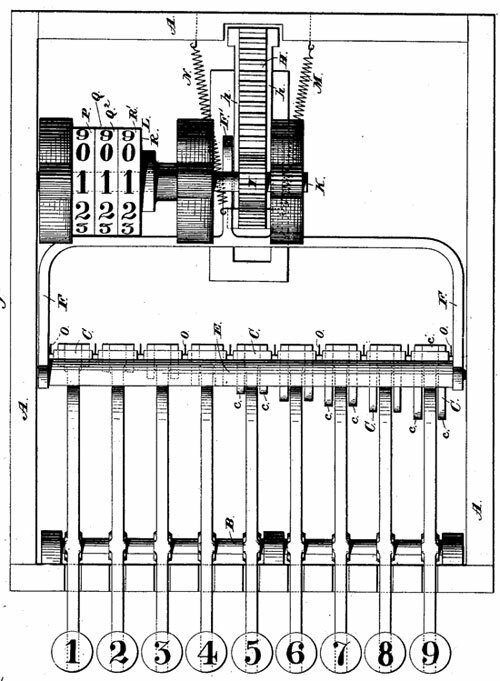 On 9 May, 1882, Walter C. Snelling of New York, received the US patent No. 257775 for an adding machine (column adder) with capacity up to 999 (see the lower patent drawing). The machine of Walter Snelling looks like it has a simple and reliable construction, but it never went in production and remained only on paper. The inventor—Walter Comonfort Snelling, was born on 21 March 1859, in Chicago, to William Walter Snelling (1829-1863), a sailor, and Susan Otheman Macreading (1836-1909), a teacher. Snelling's are New England Protestants who arrived in America in 1649 one step ahead of Cromwell, because they were royalist and Cromwell had a price on their heads. Walter Comonfort Snelling married on 20 October 1879 in Washington, DC, to Alice West Horner Snelling Moque (1861-1919), a journalist and author. They had 2 sons. Their first son, Walter Otheman Snelling (1880-1965) (see the nearby image), is a famous US chemist and inventor who contributed to the development of explosives and liquefied petroleum gas. Walter Comonfort Snelling died on 1 July 1893, in West Chester, Pennsylvania.